Get started today working with all your Microsoft and IBM Lotus Symphony applications using JAWS, the world's most popular screen reader. 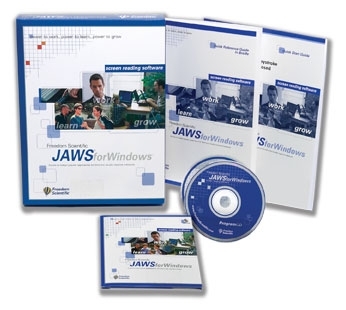 Developed for computer users whose vision loss prevents them from seeing screen content, JAWS reads aloud what's on the PC screen. JAWS enables you to work with Lotus Symphony, a suite of IBM tools for word processing, spreadsheets, and presentation creation and with Lotus Notes by IBM. JAWS also is compatible with Microsoft Office Suite, MSN Messenger, Corel WordPerfect, Adobe Acrobat Reader, Internet Explorer, Firefox - and many more applications that are used on a regular basis on the job and in school. With a refreshable Braille display, JAWS also provides Braille output in addition to, or instead of, speech. An array of versatile features and customizable options lets you tailor JAWS for your individual needs and preferences.